Preheat oven to 220°C (425°F). Divide the pumpkin, garlic, thyme, oil, salt and pepper between 2 large oven trays and toss to combine. Cook for 30–40 minutes or until the pumpkin is tender and golden. Use a fork to roughly mash the pumpkin and garlic. 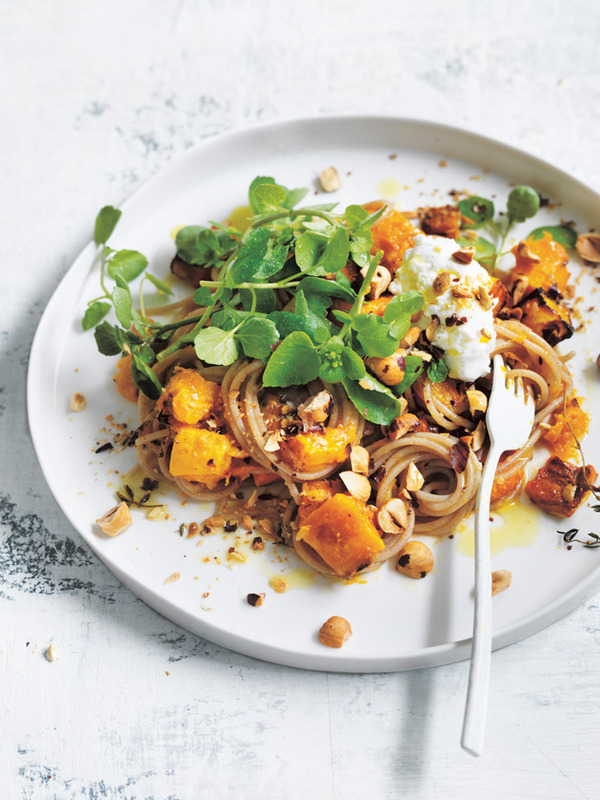 While the pumpkin is cooking, cook the pasta in a large saucepan of salted boiling water for 8–10 minutes or until al dente. Drain, reserving 1 cup of the cooking water. Return the pasta, reserved cooking water and mashed pumpkin to the pan and toss to combine. Top with the watercress, goat’s curd, extra oil, salt, pepper, hazelnuts and chilli flakes to serve. Serves 4.